The 2017 Content Marketing Institute and MarketingProfs B2B content marketing research uncovered some fascinating insights this year. One of the most interesting aspects of this research was the techniques B2B marketers are leveraging to better understand their target audiences. And the techniques they aren’t using. When asked which techniques they used to better understand their target audience(s) for content marketing purposes, “Auditing Existing Buyer Data” didn’t even crack the top ten (at 24% of respondents). Now there’s a real head-scratcher. So what were the top 3? While all of these techniques are wonderfully helpful, I’d gamble they aren’t giving B2B marketers the ammunition they need when it comes time to flesh out an editorial calendar. This points to a truth that Adele Revella has spoken about, blogged about, and even wrote a book about. When it comes developing content, the majority of B2B marketers are simply making stuff up. They’re acting on a hunch, publishing tons of content to see what sticks, hoping their gut is pretty close to what customers or prospective buyers need to hear. But most of the time, they’re dead wrong. 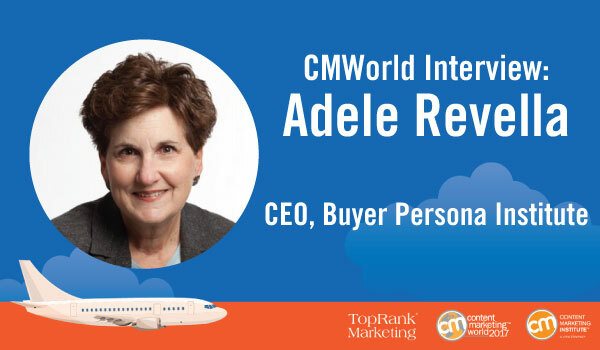 I recently interviewed Adele to get her thoughts on this, as well as hear about her upcoming CMWorld talk. It was an inspiring and insightful conversation. If you have the time, please read her book. In it, Adele literally unveils her entire business process, and reveals the playbook for crafting true buyer personas. Question 1: When looking to paint a more comprehensive picture of buyers, which attributes should content marketers seek to uncover? “We make a key distinction upfront between buyers and customers. A buyer persona is there to help you be better at communicating with potential buyers. A customer persona is about helping customers once they have purchased. First off, the key isn’t in the attributes of the buyer. While we do recommend that companies keep it simple by focusing on a few demographics like industry, company size, or job title, what really matters about your buyers isn’t in these basic attributes. Rather, it’s all about the how, when, and why of the buying decision you want to influence with your content. Question 2: If content marketers have limited budgets, what activities or steps can they take in developing personas? “Frankly, I would encourage marketers not to spend too much time creating buyer personas or profiles. Rather, try to gain insights from buyer interviews. It really doesn’t have to cost any money at all. If someone can get to, and interview real buyers in the right fashion, then you’ll be well on your way. I would argue that the time invested in performing interviews is going to save B2B content marketers so much time on the back end. Instead of making stuff up, or going through endless revision cycles with internal stakeholders or clients, you can offer buyer interview insights as a stake in the ground about what content needs to get produced. This will save significant time and money. – questions the wisdom. It’s really about where are the marketers spending their own time and budget. Frankly, I have a training background; my heart was always in teaching. The mistake that nearly all marketers are making today is thinking about too many personas. Not only are they making stuff up, they’re making stuff up for multiple personas. It’s more content for more personas, without any real insight. In the end, it’s a wasted effort in most cases. Truthfully, there are very few instances that we should be making different content for different audiences. We interview thousands of B2B buyers in our work, and these guys are building consensus among their buying committees. They are looking, and responding to the same stuff. There might be one special decision maker that needs a few key questions answered, but frankly that’s it. The rest need to have the same questions answered. This idea that we need different content, and different messages for each buyer is consuming an enormous amount of time and budget, which is simply being misallocated. Question 3: When only 37% of B2B marketers have a documented content strategy and only 34% say that their content is very effective, which aspects of content marketing strategy should marketers focus on first, in order to get improve performance? But they don’t really have the ammunition to stand up and say, “Hey, hold on, this is what the buyer wants.” A strategy ought to be built at the intersection between what the buyers want to hear and what we have to say. They don’t know what the buyer wants, so they aren’t making good choices. And strategy is about choices. This road leads to what I call Random Acts of Marketing. Question 4: What is the biggest content marketing opportunity today? “Building a strategy based on buyer insights gained from real-world buyer conversations. 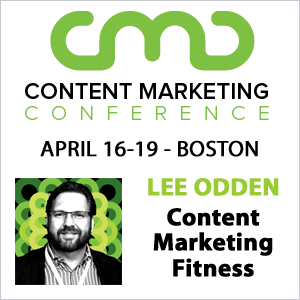 This is one of the things I am talking about at Content Marketing World this year. First of all, it’s not practical for marketers to stop production, and focus on strategy for a set period of time. That’s NEVER gonna happen. Marketers are measured by how much stuff they produce. How many leads we produce, how many MQLs we produce, how many pieces of content we produce, whether we got everything done in time for the launch. We’ve got to get realistic about this. The reality is when you do persona work, the goal ought to be start small. Take one hard-to-achieve goal: a new market, a new product, something that the organization can recognize will operate outside of “business as usual.” That’s the place to isolate a single resource to go do some of these interviews, and build real-world buyer insights. People think this is a huge task, but in 10 interviews you can learn enough to change everything. That being said, this is a very specific type of interview. You need people who have a background in journalism. People who aren’t going to be scared to death to get on the phone with someone who is representative of the target buyer and is willing to have a structured, but unscripted conversation with that person. Get the story. The truth is you don’t need personas. You need guidance to go change the way you do something. Change isn’t going to happen if everything’s “working.” Everyone’s too busy doing everything else. You’re not done. Question 5: How do you have a good interview with buyers? “If you’re not a person who can comfortably conduct interviews, you need to find someone who can. Go to your local college and talk to journalism students. Or hire folks with a journalism background. Or someone who has significant qualitative research experience. The other options is practice the skills you need to get good at this. For marketers following a seat-of-your-pants approach, it won’t be as good – but they’ll certainly learn stuff. Unlike most business books, my book literally lays out all of our intellectual property and shows you how to do this. Should you choose to invest time, it’s absolutely something you can learn. I won’t lie, doing interviews well requires decades of experience. But that shouldn’t stop you from diving in head first. Question 6: What are a few signs that buyer-centric content is working? “In B2B marketing our ability to measure anything we do on sales results is difficult at best. I encourage marketers to keep their existing set of engagement metrics and obviously look for change. But also, start measuring how many efficiencies you’re gaining within the organization. It’s what you’re able to STOP doing that’s the measure of success here. How many times recently have you stopped doing something and it helped. Being able to push back against the organizational pressure and random ideas that come at you, when you know that your focus is working. Marketing is everyone’s playground, and when we can start to see random acts of marketing diminish, we know we’re being successful. Question 7: What are you looking forward to most at Content Marketing World 2017? What I love about Content Marketing World is the people. Not only are there tons of smart marketers, it really feels like meeting up with old friends. I love the dialogue. We simply have to keep learning. I’ve been around this industry a long time, and I can say for certain that we have NOT cracked the nut on marketing. It’s in having this dialogue with each other that we can crack the nut. If you’d like to learn more from Adele and other amazing Content Marketing World speakers, be sure to check out the first eBook in our series, The In-Flight Content Guide: Prepping for Your Content Marketing Expedition. Also, stay tuned for our next speaker interview coming at you next week!